Raw whey protein 2.2 lb unflavoured comes with a comprehensive amino acid profile, which benefits of 10.8g of essential amino acids and 5.2g of branched chain amino acids in each serving. It delivers 24g protein and 5.2g BCAA per serving (30g) making it a highly effective product for muscle sythesis and gain. Raw whey protein in an unsweetened and unflavoured protein supplement which can be used in whichever way the customer wants different flavours for each serving, protein cake, protein bar, protein smoothie etc. it helps to provide the fitness enthusiast with the flexibility to add flavours as per their choice. The potent BCAAs include leucine, isoleucine and valine, which helps to reduce fatigue, enhance muscular strength and rapid muscle recovery after rigorous workout sessions. 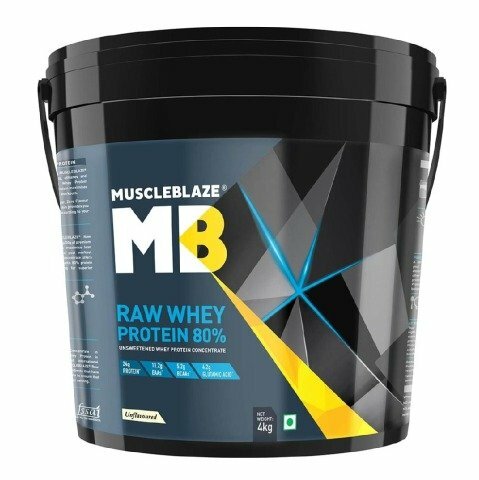 To Recieve updates and possible rewards for MuscleBlaze 80% Raw Whey Protein please sign in. To Recieve updates and possible rewards for Diet Supplement please sign in.